Colors: Dark grey, red, and black. High-ranking members of the house also include white in extremely formal situations. General Description: House Raisaal has ousted Urbain, taking its place among the Great Houses of the Final Empire. Forged in the fires of discipline and loyalty, the Raisaal are nearly unmatched in raw combat skill. Their hazekillers provide the best security and protection within the empire, and the House itself, while it has not borne a full Mistborn in over a dozen generations, produces a great number of skilled allomancers. Other Houses may be larger, or wealthier, or more powerful, but Raisaal is unmatched in martial skill. This "new" Great House actually has a parasitic relationship with House Urbain. When we killed Lord Urbain, Raisaal immediately seized the opportunity to ascend again. The two houses have complementary businesses, and while Urbain was more mercantile, Raisaal is militaristic, and so Raisaal has always flourished in times of crisis. Raisaal actually took over Keep Urbain, though records show that the keep was originally a Raisaal one. They've eaten each other for centuries. Right now, Urbain grudgingly grovels to Victre. They hire out mercenaries, most notably hazekillers, which they proclaim to be the best hazekillers in the Empire. Raisaal is not incorrect in their assessment: every member of Raisaal is trained from an early age in combat, and when they become of age, many serve under alternate identities and are hired to Raisaal's clients like any other hazekiller. So, if you want to assassinate someone, I would strongly advise to avoid Raisaals if you'd like your assassins to continue living. Additionally, Raisaal is strong Allomantically, with many Mistings. They are quite a pure line. I suspect more than a bit of Urbain's Allomancy comes from Raisaal. Of the Great Houses, their military forces are the best--though Sureau has many troops, Raisaals are better, with far superior commanders, and while Venture and Deveaux are incredibly dangerous, Raisaal still makes combat their singular goal. The only reason they are ranked as low as they are is due to a lack of ludicrous wealth that the other Great Houses have access to. Proper training is expensive, and as expensive as Raisaal hazekillers and mercenaries are, margins are not phenomenal. Still, during these years, business has been booming for them. House Raisaal also has an immensely secretive contract with the Ministry and the Lord Ruler, one which is not to be spoken of except to your most trusted confidants. The contract involves the formation of a group of hidden assassins to do special tasks for the Lord Ruler, ones that are too sensitive to deal with an Inquisitor or other means. These "Black Haze," as they are known, are the best of the best, and are not to be taken lightly. I have confirmed that an individual Black Haze member has killed a Mistborn in single combat. And while I cannot determine who specifically the Black Haze are--I believe the full list is only known in the Lord Ruler's memories, or with Lord Raisaal--I estimate there are somewhere between ten and fifteen members (though this is speculative), and they are all in the Central Dominance. Be wary. Raisaal is not someone who you will need to immediately worry about, though perhaps in the longer term, especially given their upcoming alliance with Elariel, which will probably signal long term changes in Central politics. Still, there are more prudent targets for you, which I hope I have persuaded you are more vital targets. You need not waste resources on this "new" Great House only to be met with shocking resistance. If you do strike them, do so with overwhelming force and do so in a single instant. But that would play your hand quite spectacularly, would it not, my friend? Don't be foolish. For their obvious military threat, I assess a Danger Rating of A-. Financial Avenue: Security and weapons. Raisaal trains and maintains a veritable army of the undisputed best hazekillers within the Final Empire, holding a near-stranglehold on the private security market. Known for their martial skill, tactical intelligence, discipline, and complete discretion, Raisaal hazekillers are used by many noble houses and Ministry officials. In addition, Raisaal manufactures their own hazekiller gear and weaponry, considered among the highest quality. House Raisaal, since it’s ascension, has begun growing interests in other industries, but their primary wealth and power come from their hazekillers. -Venture – [Positive] – Good dealings and pleasant meetings between these houses have led to a positive relationship. -Deveaux – [Neutral] – Deveaux and Raisaal have peaceful relations, the latter too new to the political scene to have tipped the balance one way or another. -Hasting – [Negative] – Hasting is too close to Sureau to be trusted. Or liked. -Tekiel – [Positive] – Good dealings and pleasant meetings between these houses have led to a positive relationship. -Lekal – [Ally] – Dealings between Raisaal and Lekal have been mutually beneficial for centuries. -Casuana – [Negative] – A number of broken contracts, as well as competition in the weapons market, have soured relations between these two Great Houses. The Steel Ministry: Raisaal provides hazekiller security for designated obligators within the Steel Ministry, within every Canton. House Venture: House Venture hires Raisaal hazekiller trainers, as well as maintains an ongoing contract for on-demand personal security when traveling. House Lekal: Lekal supplies Raisaal with food in exchange for security services. House Elariel: Following the rescue of Daerra Elariel by Raisaal haze killers, the Elariels have hired their haze killers solely from the Raisaal ranks, and use those they hire to train their own. Many think this is just the Elariel's looking to buy the best, but in truth the Elariels are receiving Raissal trained haze killers at a discounted rate in exchange for helping House Raisaal attain and maintain their rank as a Great House. House Raisaal is run by the head of the House (known internally as the Captain-General) who selects an heir from the main line of the family. The heir is usually the first-born, but this is not a requirement; the Captain-General may select any child of the main line they deem most suited to ensure Raisaal strength and glory. House Raisaal has several branches that spring from the main line, each with it’s own head (Captain) who defer and report to the Captain General. They have authority over how their branch is run, with the veto power of the Captain-General on all matters except the designation of branch heir. These Captains form the Raisaal Inner Council, who will also select from among themselves a new Captain-General in the event the current head dies and leaves no heir. Not only do they train the best hazekillers in the empire, they count themselves among their ranks. All children of Raisaal are trained in combat from the time they can walk unaided. At age eighteen they may choose to end their training, if personal interests find them desiring a different occupation. Those that remain in the ranks will, at the age of twenty, spend six years as hired hazekillers under assumed identities, treated as any other rank-and-file hazekiller. At the end of their six years, they will return and retake their positions within the family. What they choose to do with their lives left to their own discretion, save that they retain their rank and responsibility within the Raisaal forces as needed. Raisaal does not administer a beating to induce allomancy, as other noble houses do. Instead, an attack on the keep is staged in which the children believe they are honestly fighting for their lives. They are pressed to their limits in this attack, and often made to believe someone close to them has been killed. It is an extremely effective method, and one in which the Raisaal believe accounts for the high number of allomancers within their House. 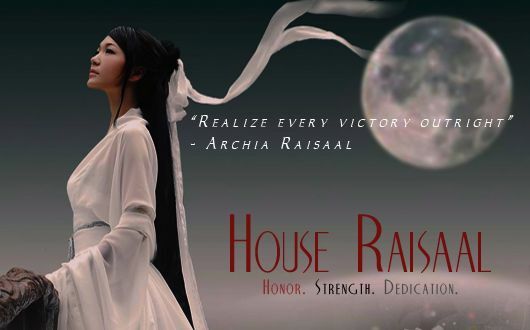 House Raisaal traces it’s origins back to before the founding of the Final Empire, when Archia Raisaal swore herself, her family, and her sword to the Lord Ruler upon his ascension. Little is known of Archia, but her skill as a warrior persists within Raisaal legend to this day, and the Raisaal style of unarmed combat was developed by the woman herself. Keep Raisaal is located approximately halfway between the Zinc Gate and Kredik Shaw, in the eastern half of Luthadel. A bit smaller than the Keeps of the other Great Houses, Keep Raisaal is constructed for defense, efficiency, and tactics. The exterior consists of a stone wall twenty feet high, running in a circle around the inner Keep. The front entrance consists of a high, thick wooden door, flanked on either side by short guard towers. Every ninety degrees around the circle of the outer wall is another entrance, much smaller but more often used and no less defended. Inside the front gates, a great courtyard covers nearly half the interior. Well maintained and tended, the western half of the courtyard contains training fields, barracks, and officers quarters for those not of the Raisaal blood. The eastern half is meant for parties and entertaining, consisting of open courtyard with benches, a central fountain, and the gardens, which while lovely, are actually designed to provide food in the event of a siege. On the upper hemisphere of the inner walls is the keep itself, a massive fortress, it’s sheer walls rising seven stories into the sky. Between the keep and the courtyards is the central tower, a circular column of stone rising twelve stories into the sky. The central tower is where the main ballroom is located, taking up the first through fourth floors, with stairs and platforms rising along the inner walls. Below is the private training room of the Raisaal family. Edited by Chaos, 06 October 2013 - 08:49 PM.